blacklilypie: Give Batcat a Face! The new item I sneak peeked a little while ago is ready and in the shop! 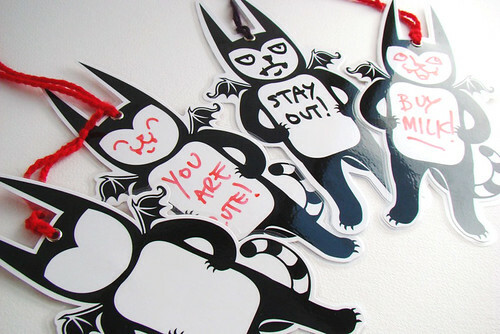 A little Batcat dry erase memo body! I am totally a "write it down or I will forget about it" kind of person. Maybe that is why I really like the idea of dry erase memo boards. Leave a little note, reminding, noting or maybe even teasing. I love finding notes to me from people, its super fun! 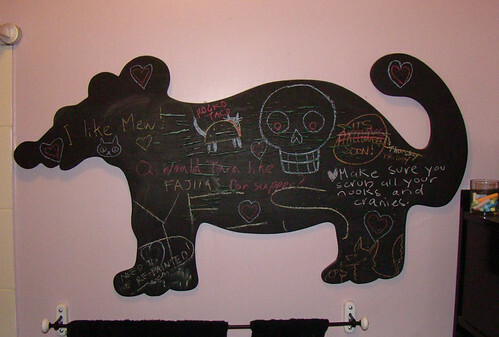 This is a blackboard in my bathroom that people can write cute stuff on. Washroom graffiti! It needs desperately to be repainted due to the humidity of my crappy washroom, but that has to be done outside. I will have to wait until spring. My dad made this "dog" for my brother when was a little kid, in the shape of his imaginary friend/dog. Imaginary dogs don't have to be dog shaped you know. I bet it you its over 20 years old now. HOLY. If I had my way I would have note leaving places all over my house. You never know when you have to draw a taco cat, or remind people about Halloween. In fast I have a few notes in front of me that say "butternut squash," and "wallz" (No idea what that one is) and "new bloggitude." Life is sweet. 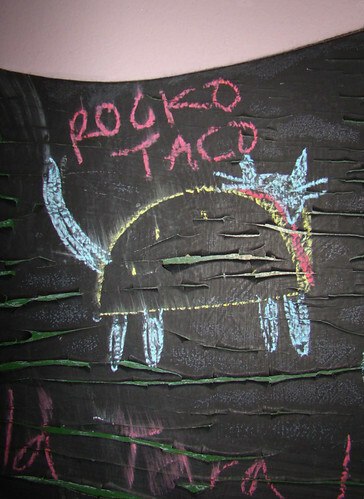 Are you saying that the chalk drawing is over 20 years old or just the idea of the Taco Dog? Which, btw, is adorable! Your Dad sounds like a pretty cool guy. And I really like your new header and background. Very cute! I like the new banner n stuffs too... looks great! That is true! I could really use note leaving places all over my house for sure! "remember to buy Laundry soap". I walk away from one area of the house and totally forget what it was I needed in the other room. Good idea! lol Cute dog board. Carolyn: Yeah! You could jut keep one message and reuse it. Like keep it by the soap and move it to somewhere visible when you need it. Glad everyone likes the new look.